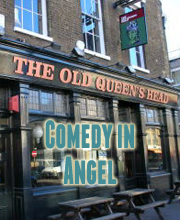 Laugh Out London Returns to the Old Queens Head for another ace night of comedy, headlined by the wonderful comedy hip hop superstars that are Abandoman! Undoubtedly the best Irish improvising comedy hip-hop duo around. A huge hit at festivals across the world for very good reason. One of the cult hits of the festival last year Jordan’s debut show earnt him impressive reviews and a nomination for Best show at the Comedians’ Choice awards. He has previously won the Welsh Unsigned Stand-up Award 2012.